You can call this recipe a “Blueberry Delight,” “Blueberry Bliss,” “Blueberry Yum-Yum,” or “Blueberry Dream,” but just be sure you put making this recipe on your to-do list soon! If you love blueberries, you are going to LOVE this Dessert! 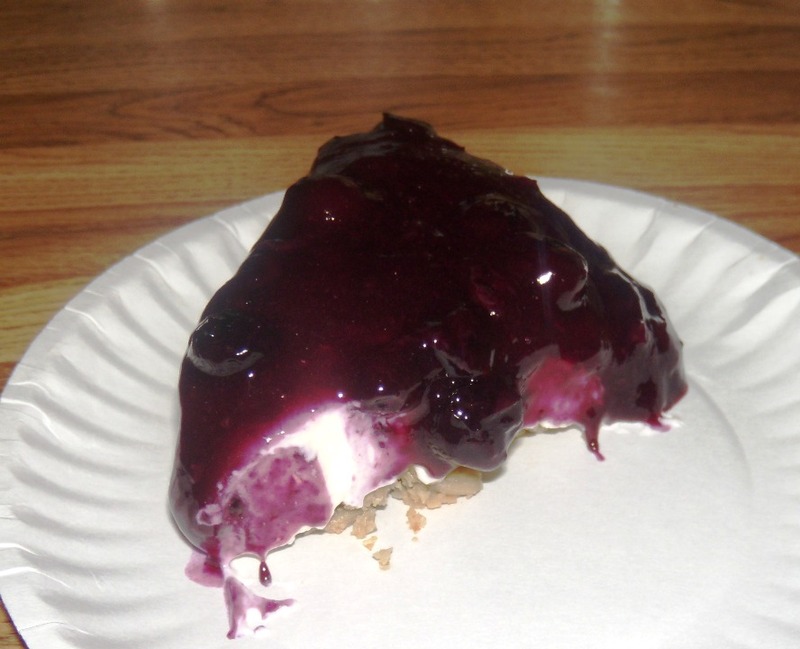 With it’s sweet and salty crust and creamy, cream cheese filling covered with a fresh blueberry topping, you just can’t go wrong! No one will ever know that it is Grain-Free & Low-Carb! Happy Father’s Day Daddy! Father’s Day is a very difficult holiday for me, one of sadness but also of contentment and joy. Twelve years ago my daddy passed from this earth but received his complete healing. When I was 21, the greatest man I ever knew had a stroke and died within the week. I never really got to say good bye, but God allowed certain events to take place the weekend prior that to this day give me peace that he is in a better place. Even though I knew he was not suffering any more, I was still heart broken. It was like a nightmare, only when I would wake up, he still was not here. I often asked God why He took my dad so soon but I never doubted Him. Over the years my Dad was with me, God used Daddy to show me true love, to show me how to be a good parent, and how to work hard and help others. He left a legacy of love and for that I am so grateful! I feel so blessed to have had 21 wonderful years with such a loving and caring man. Even though he is no longer here with me, I know one day I will see him again. ‘Tis better to have loved and lost than never to have loved at all” has never been so true! I look forward to telling my boys about how wonderful their granddaddy was, and I am inspired daily to be a better and loving parent because of my Dad. It is no coincidence that I married someone a lot like my father. I am blessed beyond measure that my children have a wonderful father just like I did. Take time this Father’s Day to spend time with the important people in your life, whether it be your Dad or a special friend. Make them their favorite food and just enjoy spending time with them. Make memories that will last a lifetime. Happy Father’s Day to all of the dad’s out there and to every man who has played the role of a father figure in a child’s or even an adult’s life, this recipe is for you! This recipe is just as dreamy and delicious as it looks! This is a variation of two other recipes from the blog, my Southern Strawberry Delight and my Strawberry “Pretzel” Salad, both which have been a BIG hit! I decided on a blueberry dessert this year since it’s blueberry season and my in-laws just gave me 4 gallons of fresh blueberries from their bushes! Seriously, the best blueberries I have ever eaten! My mother-in-law made a similar recipe last year using a graham cracker crust, Cool Whip and blueberry pie filling but I thought I would make it a bit healthier and bring it for Father’s Day since my father-in-law really loves this type of dessert! I know this recipe will be a big hit! Sweetener: Use any sweetener you choose. Be sure to check out THIS post about why I use stevia and VERY small amounts of either raw honey or organic coconut sugar in recipes. As always, taste EVERY layer for sweetness and adjust the sweetness to your liking. Fruit: I used fresh blueberries but feel free to use any berry you like, fresh or frozen. Cherries, raspberries or strawberries would all be delicious. Nut-Free: For nut-free, substitute ground raw sunflower seeds in the place of the almond flour in the pie crust. Also use raw sunflower seeds in the place of the chopped nuts. Dairy-Free: I have not make this recipe dairy-free. Be sure to make extra Blueberry Topping (I actually doubled the recipe for the Topping) so that you can pour it over gelato, pancakes or biscuits! I hope you have enjoyed this blog post. If you love my site and have enjoyed all of my recipes and content, please consider sharing this post, and supporting me through my affiliate links. Thanks so much for your continued support! *I used 1/8 tsp. Trader Joe's Stevia and 1/2 tbsp. raw honey. The amount of sweetener needed will depend on the sweetness of your blueberries. Once the blueberries have burst and released their juices, remove the lid and lower the heat to low. Stir in sweetener and vanilla then add the arrowroot and water. Stir the blueberry mixture until it starts to thicken (about 1 minute) and then turn off the heat. Taste for sweetness and adjust if needed. Pour into a bowl and refrigerate until completely cooled, about 2 hours or overnight. Preheat oven to 350 degrees F. In a medium bowl, blend almond flour, pecans, salt and stevia. Stir in melted butter. Taste for sweetness and saltiness and adjust if needed. Press into the bottom of an 8 inch round casserole dish or cake pan. Bake for 20 minutes or until crust is slightly brown but not burned. Allow to cool completely. While cooling, prepare the Cream Cheese Layer. In a large bowl, blend cream cheese until smooth. Add heavy whipping cream, vanilla, and sweetener and blend until thick. Taste for sweetness and adjust if needed. Refrigerate until the crust has cooled. Spread the Cream Cheese Layer over the cooled crust. Pour the Blueberry Topping over the Cream Cheese Layer. Serve immediately or store in the refrigerator. Oh yes, this will be tomorrow’s cooking project! It looks sinfully delicious! Having to learn to eat low carb ( giving up my beloved bread ) is hard enough without never being able to have a guilt free treat , but now I don’t have to, so Thank you from the bottom of my heart!!! This looks delicious, I plan to make it for my dad (who is diabetic) on Father’s Day. I will use T-Joe’s Stevia (I have the drops) and possibly some Xylitol. I also wanted to thank you for sharing about your dad, that was sweet! How much pink salt in crust? Logically, has to be 1/4 tsp. , but doesn’t say. Looks awesome good. Gonna make SOOOOOOON. Rachel, yes, 1/4 tsp. I hope you enjoy! May God bless your Dad! Beautiful tribute! I whipped this recipe up this morning – it took only about 40 minutes. Of course I sneaked a little taste and it’s soooooooo delicious! I love the crust, which I made using ground and whole raw sunflower seeds because of nut allergies in the house. Another amazing recipe, Melissa! This looks delicious! I think this might have to be birthday dessert this year. If I make it on a Wednesday, would it stay okay in the fridge until Saturday? Maybe make the blueberry topping and leave it in a separate bowl and add that on Saturday? Looking at the nutrition, especially the carbs ~ are the carbs from the honey counted in the nutrition? I made this yesterday, took a photo (it’s such a beautiful dessert), posted it to Facebook and I had so many hits. One friend, who I didn’t know was gluten free was so happy that I shared this. I also made sure Satsfying Eats was given full credit. Hoping you’ll get more converts! P. s. It was just as delicious as it looks, thank you. I made this for Father’s day for my husband and kids. It was such a big hit. I am definitely making it again. i am getting conflicting info online so could you tell me, how many carbs in a tablespoon of honey? Does the 6.9 carb count take in all the honey you used, half a tablespoon plus 2 teaspoons? Sarah, I am glad everyone enjoyed it! 🙂 Yes, the carb counts are including the optional ingredients like honey. I don’t “save” my recipe because they are so many but here is the site I use: http://caloriecount.about.com/cc/recipe_analysis.php It takes a little figuring out but I like it because I can enter an entire recipe. I hope this helps! What a great link! Thank-you! This is soooo good! I put a strawberry topping because up north in New England that is what is ripe. We love so many of your recipes. Had the Ranch dip with raw veggies tonight and my family loves it. Thank you for all the work you do. Your cookbooks are on my counter everyday! 2nd time I made this. I followed the recipe exactly and very very yummy. The 2nd time I made with a mix of raspberries and blueberries. Thanks so much for your awesome recipes. Wondering if I used strawberries instead, would I use same directions and other ingredients for compote? Thanks, I did see the strawberry pretzel recipe as well but liked the compote idea better then then the jello type topping:) I will mix it up and see what happens! Love what I’ve seen after being on your website for 10 minutes! You have so many great recipes, keep them coming!. I love your recipes! and this one looks so yummy!. I hope you will have more grass fed gelatin recipes coming. This is GREAT! The first time I made it with canned coconut milk instead of whipped cream but it was a bit thin. For company I made it as directed and everyone loved it. Thank you for making sugar free and low carb desserts. Yes ma’am Jennifer, all my recipes are low-carb!